Custom dolls are my specialty! 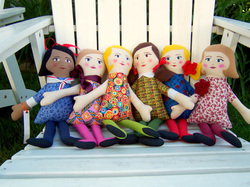 I'd love to make a doll to look like a loved one for you or your favorite doll lover. Wholesale and consignment are available for gift shops and boutiques! I would love for you to carry Hen and Chick dolls and accessories in your brick and mortar store. Contact me below for a line sheet. I would love to hear from you! Let me know what you love about Hen and Chick dolls, what you'd like to see me make next, or ask a question!